SEYMOUR – All-Star Transportation completed a key project today as it continues with its efforts to convert its fleet of diesel vehicles to cleaner, more-efficient propane. 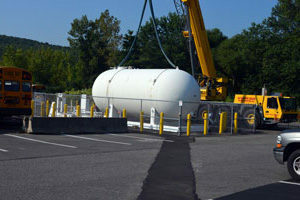 A new, 18,000-gallon propane tank was installed at the company’s Seymour terminal. 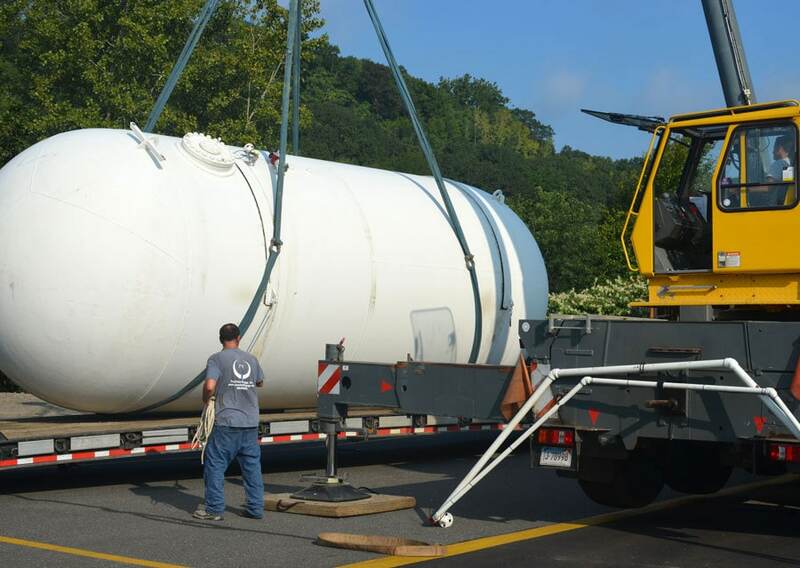 Once fully operational, the new tank will provide fuel for the 21 school buses that serve Seymour public schools and three others that transport Region 16 students in Beacon Falls. The effort to install the new tank has been ongoing for months. A concrete platform and piping were installed much earlier while the tank was under construction. Once it was completed, the tank was transported from North Carolina. 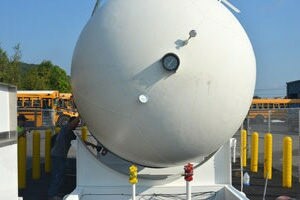 The new tank was just the latest in improvements made at the Seymour terminal. Over the summer, the terminal received a new coat of paint, a new floor was installed in the shop break room, and the front office was fully renovated to create new office space and space for staff to gather. Work at the Seymour terminal is part of All-Star’s long-term plans to modernize and upgrade its terminals. In addition to Seymour, All-Star operates propane-fueled buses at its terminals in New Milford and Newtown. TORRINGTON – Stephen Rosko has been tinkering with cars and trucks for as long as he can remember. And so it is no surprise that he recently became certified as a master school bus technician at All-Star Transportation’s service center in Torrington. In fact, at age 23, he is one of the youngest master technicians at All-Star. “I’ve always enjoyed working with my hands and doing this sort of stuff,” says Rosko, who joined All-Star as a full-time employ a little over three years ago. Prior to that he was a college student pursing a degree in criminal justice with an eye toward becoming a police officer. “I didn’t like how the criminal justice (system) was going and what it takes to be a cop these days,” he says. So, he focused on what he knew and liked. He took a job at the Torrington location, where he had worked as a student at Wamogo High School in Litchfield. “When I was still in high school, I spent summers here working with my father,” he says. His father is Steve Rosko, the director of maintenance for All-Star Transportation, who also began his career with the company as an entry-level mechanic out of Wamogo High School. “I started as a helper and worked my way up,” the younger Rosko explains, adding that he likes working for his father, even though he might face a little more scrutiny than others. To achieve master technician status, the younger Rosko had to successfully complete a series of six exams offered by the National Institute for Automotive Service Excellence that tested his knowledge of mechanical systems specific to school buses. He studied and passed all the tests in a year, completing the final one in June. At the Torrington location, Rosko works on both propane- and diesel-fueled vehicles. As for the future, he says his next step is to complete certifications offered by individual manufacturers for their specific vehicles. WATERBURY – All-Star Transportation has won a prestigious $50,000 grant to purchase cutting-edge technology designed to enhance the safety and security of the school buses it operates in Litchfield, New Haven and upper-Fairfield counties. The 2018 Don Carnahan Memorial Technology Grant is sponsored by The National Association for Pupil Transportation and Zonar Systems Inc., a Seattle-based company that provides smart fleet management solutions. The Zonar technology will make it possible to track buses to monitor fuel usage, speed, idling time and other operational issues. The technology also can provide alerts when buses aren’t operated safely or when they need maintenance. A total of 250 Zonar systems will be installed on All-Star buses based at the company’s terminals in New Milford, Newtown, Prospect and Torrington. “We are focused on ensuring the safety of our students and providing our customers with great value,” said Leslie Sheldon, All-Star Transportation’s operations manager. 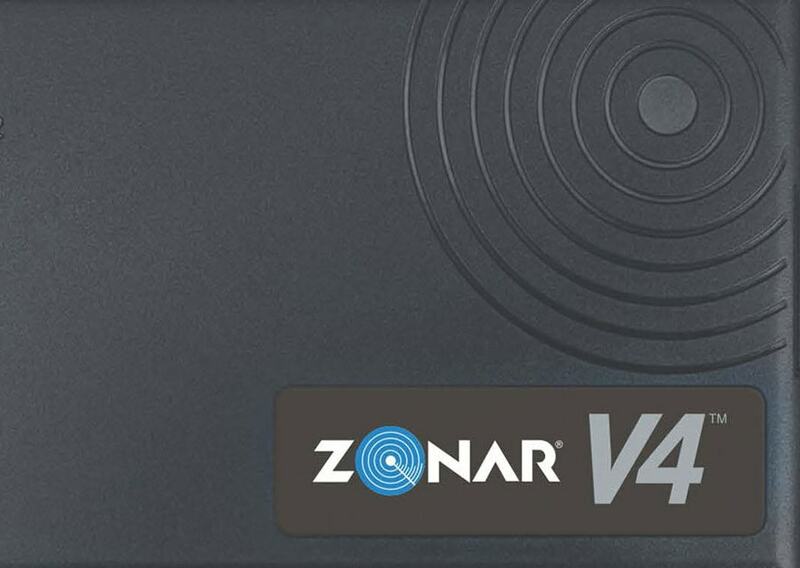 “We successfully tested Zonar technology on our Waterbury fleet during the 2017-18 school years, and we believe it is the right product to enhance our fleet and improve our services. “Looking to the future, our plan is to phase in the use of Zonar technology companywide over the next few years,” Sheldon added. Based in Waterbury, All-Star Transportation employs more than 1,000 and operates 18 school bus terminals servicing the in-district and out-of-district transportation needs of 35 cities and towns. 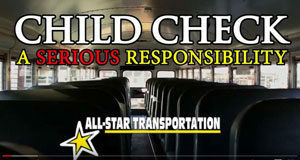 All-Star Transportation safely transports more 47,000 students every day during the school year. The grant is named in honor of Don Carnahan in recognition of his lifelong contributions to the student transportation industry. Carnahan dedicated 45 years to the education and pupil transportation industry. He joined Zonar in 2003 and served 11 years as a company leader. He also was a two-term NAPT president. NEW MILFORD – Even though women hold many key positions at All-Star Transportation, the staff at the company’s three maintenance shops had for years remained all male. But that changed this spring when Sarah Fontoura was hired as a service technician in New Milford. But Fontoura brings more to the job than just a passion for cars. After graduating from New Milford High School in 2013, she completed a two-year automotive technician program at Naugatuck Valley Community College, earning an associate’s degree. She also became a skilled welder while at NVCC. After completing her schooling, Fontoura worked for two years at a large auto repair shop, where she mainly did tire repairs and oil changes. Wanting to do more, she applied to become a service technician at All-Star after seeing a help-wanted advertisement on Indeed, the Internet-based employment company. But her work experience since joining All-Star in March has been refreshingly different. “The guys here a great,” she says, naming all her co-workers who have helped and provided guidance. “I’m starting at the bottom, but if I find a bus that needs brakes or belts, I get to do it. In her spare time, Fontoura, as might be expected, tinkers with her two vehicles – a 1999 Firebird and a 2015 Jeep. She does all her own maintenance and repairs, while dreaming of the day when she has home with its own shop. 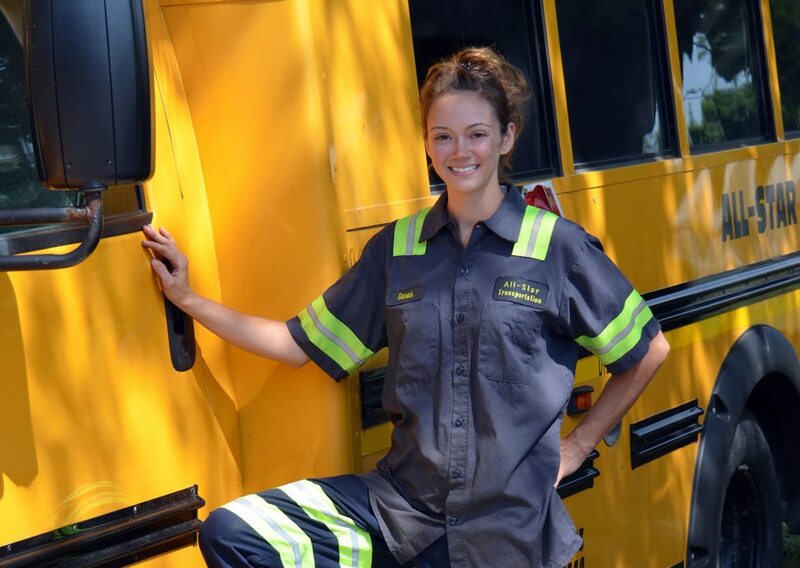 She also anticipates working toward certification as a master school bus technician after she becomes more settled in her job and learns more about buses. But she’s already acquired the materials need to pass the first test toward becoming certified. 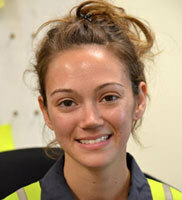 “We are thrilled to have Sarah be a member of our maintenance team. Her energy and positive attitude are assets,” says Leslie Sheldon, All-Star Transportation’s operation manager. MONROE – When the school day began on Tuesday, May 15, it seemed like any other. The sun was shining, the humidity was building and weather forecasters were predicting afternoon showers with the possibility of severe thunderstorms. A few hours later, the forecasts became more threatening. Schools responded by canceling softball games, field trips and other extracurricular events. At All-Star Transportation locations impacted by the oncoming storms, steps also were being taken in preparation for the weather. “By noon that Tuesday, we were in constant contact with the superintendent’s office, making sure all after school activities were cancelled, that all students could be delivered home and that we could get drivers out and on their way home before the storm hit,” said Alan Colangelo, manager of All-Star’s Newtown location. Cancelling events and getting buses off the road turned out to be a wise decision as tornadoes rolled through several communities, cutting electrical service and closing roads for days. Fortunately, only a few buses were still on the road when the storms hit. In Seymour, the terminal office lost radio contact with its drivers on the Seymour channel and cell phone service was spotty at best. Hardest hit among All-Star’s service areas were Brookfield, Beacon Falls, Newtown, Oxford and Seymour. Schools in Oxford and Brookfield were closed for five days, with Brookfield restarting its runs only after some routes were temporarily modified. Newtown schools also were closed for four days, while Seymour schools closed for three and Derby one. None of All-Star’s terminals sustained any damage. As for drivers, monitors, mechanics and their families, most reported riding out the storm safely with little or no damage to their homes. “A few who live out of town ended up having to find a safe spot to pull over and wait it out as the storm hit just before 5 p.m. while they were trying to head home. 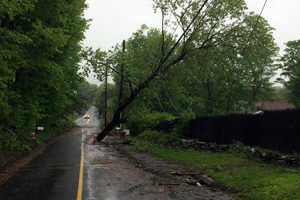 A number of drivers who live in town reported they had just pulled into their streets or driveways as trees and limbs started crashing down around them. Only two reported minor damage to their homes,” Colangelo said. 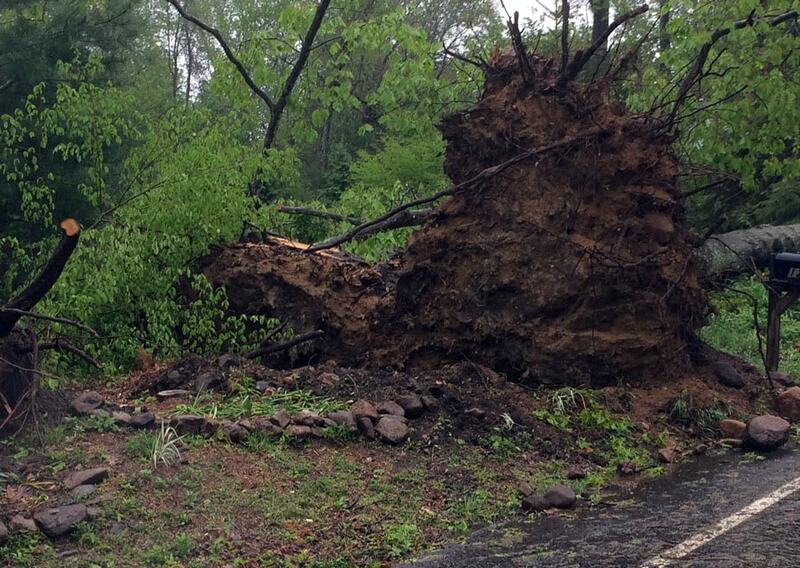 Gardner said he was driving when a tornado touched down on the Southbury/Oxford line. After the experience, Gardner said he haS a new respect for weather reports. WASHINGTON – When Krissy LaPlante is asked to explain where her artistic talent comes from, she struggles to find the words. But, fortunately, her work speaks for itself. Two years ago, LaPlante launched her career as an artist. It was just about the same time she joined All-Star Transportation as a school bus driver at the Washington terminal. She paints, creates jewelry and makes a variety of other art objects, including items for American Girl dolls. The American Girl pieces include a variety of drink cups, such as a Starbucks Frappuccino, that she first saw online and then made her own versions. For the Frappuccino she mixes silicone and then pours it into small communion cups that look like the clear cups available at Starbucks. To create tops for the cups, she purchased small Christmas ornaments that she cut in half. She also makes and paints wood cake pops for American Girl dolls. LaPlante’s five-year-old daughter, who has a doll collection, is one of her biggest fans. The Internet is perhaps the biggest source of inspiration for LaPlante. If she sees something she likes online, she’s not afraid to experiment and add her own artistic twist. For instance, she makes Lego men out of resin and uses acrylic paint to create colorful popsockets..
She also uses acrylics for her paintings, which she calls fluid art. 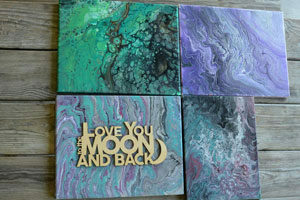 To create a fluid art piece, she pours paint onto a clean surface and then moves the paint about to create unique designs. “Last year, I saw a video online about acrylic painting, and I said, ‘I need to try painting,’” she says. She typically does her painting and her other projects in her kitchen, although she notes that she will soon move to a new home where she will have a art studio that she will share with her daughter as a playroom. When mixing and pouring the paints in her kitchen, she collects the droppings in a tub. Those droppings, after they dried, inspired another project. When looking at the dried paint, she realized “that’s a lot of wasted paint. Then I saw people making jewelry from it, and I said, ‘I can do that.’” And so she did, creating bracelets and necklaces from the acrylic, string and wire. LaPlante would love to become a full-time artist, but notes that “it’s really hard to make a living.” So, she has a Facebook page, an Etsy page and an Instagram page where she posts her items for sale. She’s also put some of her stuff in local store, selling her items in a price range from $5 to $10 an item. 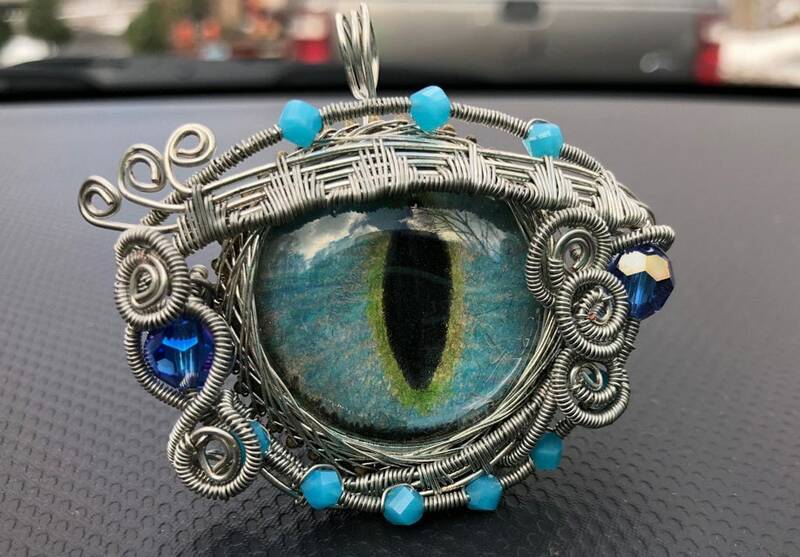 She also will display her work at a crafts fair in Morris on June 2 and at the Connecticut Garlic & Harvest Festival in Bethlehem on Oct. 6-7 (the festival is run by her co-worker and fellow bus driver David Harkness). Looking to the immediate future, LaPlante is planning to expand her artistry by taking a course in sculpture at the Washington Art Association. “I want to see what I can do with that,” she says. WATERBURY – All-Star Transportation relies on the talent and skills of its managers who oversee its 18 locations, their drivers and monitors. Our managers come to All-Star with a variety of experiences and backgrounds, but with a common mission to provide outstanding school transportation services. Brookfield – Debbie Jones has been a familiar figure in Brookfield for more than a decade. She started as a driver in Brookfield in 2001 and then became the dispatcher in 2003 when Brookfield’s routes were operated by Laidlaw. She became Brookfield’s manager in 2006 and stuck with the job when All-Star took over the routes in 2010. She supervises a staff of 41 drivers and monitors. Prior to becoming a driver, she worked for Datahr (now known as Ability Beyond Disability), starting at age 16. She held a variety of positions with Datahr, including medical supervisor, assistant manager and group home manager. When she’s not at work, she likes spending time with her family and is a volunteer for Young Moms, a group that helps nurture teenage mother and their children. Harwinton/Burlington – Marion Solgovic began driving a school bus in 1978 and was named manager of the Harwinton location in 2012. At the Harwinton location, she manages 37 drivers. Before joining All-Star six years ago, she was a manager and spare driver for Sikorski bus. Prior to 1994, she was both a full-time school bus driver and a part-time certified nurse’s aide. Solgovic says her main challenge as a manager is keeping her buses staffed and running. In her off hours, Solgovic spends time reading and enjoying her grandchildren and great-grandchildren. 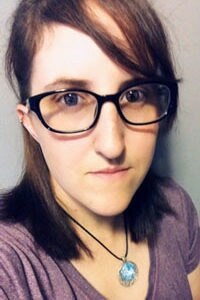 Lakeville – Michelle Way joined All-Star in 2008, working as a driver in New Milford. Two years later, she became the manager in Lakeville where she oversees a staff of 30 drivers. As a manager, she says her biggest challenge is scheduling because of the driver shortage, which is a nationwide problem. Prior to All-Star, Way worked in retail, as a bank teller and as an assistant bank manager and a regional bank manager. When she’s not spending time with her family, Way enjoys working on puzzles. Litchfield – Frank Simone started his career with All-Star Transportation as a school bus driver in 1997. He was named Litchfield’s manager in 2013 and is now responsible for 35 drivers and monitors. He is responsible for buses serving both Litchfield and the Region 6 school districts. Prior to All-Star, he worked as a maintenance supervisor and purchasing agent. For the past 16 years he has been member of Litchfield’s Board of Education, and he also serves as a volunteer for Eastern Region Little League. Monroe – Michael Lawlor has been the manager in Monroe for six years, where he supervises a staff of 61 drivers and monitors. As a manager, he says his biggest challenge is educating and informing the general public about the safe transport of children aboard school buses. Prior to joining All-Star Transportation, Lawlor worked as a production manager at a film media company, a plant operations manager for a linen service and as a district manager for a car rental company. In the community, Lawlor has served as an assistant scoutmaster and as a committee member for the Boy Scouts. In his spare time, he enjoys fishing. New Milford – Jeff Woods is the manager of one of All-Star Transportation’s largest terminals, supervising a staff of 73 drivers and monitors. It’s a position he has held since 2006, the same year he joined All-Star. Woods was a member of the U.S. Army for six years, serving from 1976-1982 as a staff sergeant stationed at Fort Knox Kentucky, Fort Rucker Alabama and Stuttgart Germany. His primary job was a helicopter crew chief, but he also attended special forces Europe sky-diving school. When he left the military, he worked as an inventory/delivery manager until he took his current position. In his off hours, Woods enjoys traveling, woodworking and antique furniture restoration. He’s also a Master Mason at Harmony Lodge No. 42 in Waterbury. Newtown – Alan Colangelo has been a manager at two of All-Star Transportation’s locations. He served for five years as the manager in Oxford (2009-2014) and then relocated to Newtown, where he oversees a crew of 65 drivers and monitors. Prior to joining All-Star in 2009, he worked for three years as a spare driver in Waterbury for Laidlaw and then became a route driver for three years. He’s worked as a fueler, snow crew member and yard man, as well as three years as a school bus dispatcher. In college, Colangelo first focused on becoming a teacher and then pursued a degree in fine arts with a goal of working for Walt Disney animation. But he says, “The temporary job of busing grew on me.” In his spare time, he enjoys sketching and oil painting, as well as glass etching. He’s an Eagle Scout and member of the Order of the Arrow (a Boy Scout fraternity). Oxford – David Decker began his career with All-Star in 2013, working as a bus driver at the Seymour terminal. One year later, he was named manager of the Oxford location, where he oversees a staff of 28 drivers and monitors. He says the most critical part of his job is collaborating with his drivers to ensure that each child travels safely to and from school. Before All-Star, Decker worked as a manager at Enterprise Rent-A-Car, as a manager at Amity Wine & Liquor and as manager at a CVS pharmacy. When he’s not at work, Decker serves as a volunteer diving coach at Crosby High School and is active in men’s soccer games on weekends. He also fills his time creating new board games. Plymouth/Thomaston – Sherry Hoag first got behind the wheel of school bus in 1995 and then joined All-Star in 2007 as a driver in Litchfield. A short time later, she was made a member of All-Star’s training and safety team. In that capacity, she helped train new drivers and subbed as a driver wherever needed. In 2015, she became a manager, but has remained active with safety and training, often appearing in All-Star’s training and safety videos. She’s looking forward to being assigned to one location as a manager, where she hopes to bring creative ideas that engage the staff and make work fun. She will manage 34 drivers in Plymouth and 17 in Thomaston. Outside of work, she and her family are avid bowlers and participate in the same league. Four years ago, she started bicycling and once took a 150-mile trip from Vermont to Connecticut that took three days to complete. Hoag enjoys spending time with her three children, the youngest of whom is currently a freshman at Nonnewaug High School, and her two grandchildren. Prospect – Carol Howson is familiar figure in the Prospect area where she has served as the terminal manager since 1991. She began managing the location before All-Star took over, working for Laidlaw, Dufour Transportation, D&L Transportation, Ryder and Dufour Brothers. She stayed on as manager when Prospect became part of All-Star in 2005. Howson began her career as a school bus driver in 1976 and now oversees 84 drivers and monitors. In her spare time, Howson enjoys spending time with her family. 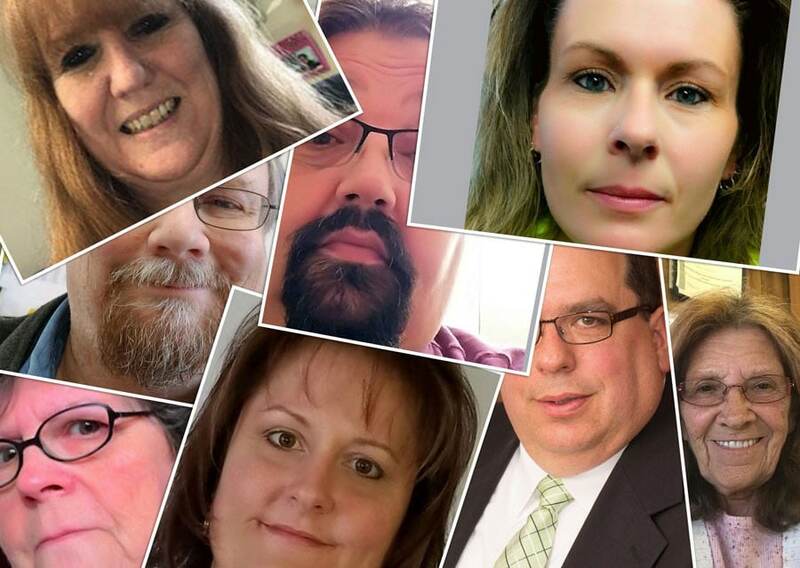 Seymour – Steve Gardner manages one of All-Star Transportation’s most challenging locations with more than 100 drivers and monitors serving four school districts – Ansonia, Derby, Seymour and Beacon Falls. His job requires quick thinking and the ability to respond to the needs of four towns. He joined All-Star in 2009 and became a manager in 2011. His previous experience includes serving as a combat engineer, a warehouse and production manager, an operations and safety manager, as vice president of operations and as an assistant auto center manager. When he’s not at work, Gardner serves as a volunteer for the Danbury Youth Organization and Danbury Youth Soccer. He’s also a singer and has performed with local music groups at Madison Square Garden, Carnegie Hall and the White House. Washington – Pamela Newton is another of All-Star’s more-experienced managers. She became the manager in Washington in 2004, where she oversees a staff of 25 people. Before being named manager, she drove a school bus the Region 14 schools in Bethlehem for 10 years. She has extensive experience in transportation. She was the contract manager for Ryder Student Transportation in Region 14, and then served as a contract manager for D&L Transportation, Dufour Transportation and Laidlaw Transit. She managed Ansonia, Beacon Falls, Derby and Seymour school buses from 1991-1994. Waterbury – Ed Costa joined All-Star Transportation in 2015 and now oversees a staff of 125 drivers, monitors and support staff. Prior to joining All-Star, he served as a deputy chief of emergency medical services, as a paramedic, a director of corporate training and as a driving instructor. The biggest challenge Costa faces in Waterbury is keeping a full staff of drivers. Also challenging is that the Waterbury location is charged with providing special needs transportation for Waterbury students, which often requires the managing of multiple route that change on a daily basis. Outside of work, Costa serves as the deputy fire chief for the Wolcott Fire Department Company 1. He’s been with the department for 37 years. He also enjoys classic cars and working in his yard. He’s been married for 32 years and has two sons. Winchester – Jody Audia is another of All-Star Transportation’s well-qualified managers. She started driving a school bus in Winchester in 1989. When All-Star took over the school bus service in Winchester, Audia became Winchester’s manager, supervising a staff of 19 drivers and 19 bus routes. She says her biggest challenge as manager is to know all the roads in her service area and then developing routes that provide the best service. Prior to becoming a school bus driver, Audia was a stay-at-home mom. And when she’s not at work, she says her greatest joy is spending time with her grandson. Wolcott – Brenda Johnson started driving a school bus in 2006 and eight years later was named the manager of the Wolcott location. In 2015, when All-Star Transportation took over Wolcott school routes, she stayed on as manager, overseeing a staff of 40 drivers and monitors. She started working at age 12 in her parents’ dry-cleaning business, Kenmore Cleaners in Bristol. She’s also worked as a commercial lending administrative assist and a loan recovery assistant. For 10 years, she was a stay-at-home mom, raising her two sons. In her spare time, she’s serves as a mentor for the Wamogo Agricultural High School tractor restoration team, as a volunteer for tractor pulls at the Terryville Fair, the Goshen Fair and Wamogo pulls. She also participates in antique car shows with her husband with a 1967 Chevy Camaro and a 2016 Dodge R/T Shaker Challenger. Woodbury – Pam Boulier drove a bus for All-Star Transportation for seven years in Prospect and Thomaston before becoming the manager in Woodbury in 2017. In Woodbury she oversees a staff of 35 drivers and monitors. Many of her drivers are new, and so she is focused on teaching them good student management skills. She has the back ground for managing people, having previously worked as a manager for Trefz Corporation McDonald’s for 17 years. It’s a Bridgeport company that operates McDonald’s fast-food restaurants. She also was a manager at Arby’s Corp. for five years. Boulier also has worked for other school transportation companies in Connecticut, including Laidlaw Education Services, where she was a safety supervisor for seven years. When she’s not working, you can find her spending time with her three grandchildren, with a fourth on the way. WATERBURY – It may not be well-known, but All-Star Transportation’s school bus drivers and monitors utilize the safety skills they learned as trainees every day they are on the job. And they receive continuous safety training throughout the school year to expand their knowledge and to make sure they don’t ignore their critical responsibilities. Critical to sustaining the safety culture that exists at All-Star Transportation is the hands-on training that the company provides to its employees from their first day on the job and continuing throughout their careers. A key piece of that training are the videos that the company’s safety team produces in-house. The videos are shared throughout the company at safety meetings and are posted on All-Star’s website, Facebook and YouTube pages for easy access. The two most recent videos focus on the child check and drop-off procedures . Drivers perform the child safety check procedure after they have dropped off the last student on each route. It requires a driver to walk the entire bus and check to make sure no child is left behind and that no important article has been forgotten on the bus. Each bus is also equipped with a child check system that is activated automatically when a driver turns on the flashing lights and opens the door to pick up a student. When a driver turns off the bus or exits the bus, the child check system must be deactivated or an alarm will sound. A driver deactivates the alarm while doing the safety walkthrough. This is the final check of the vehicle that all drivers are required to do. 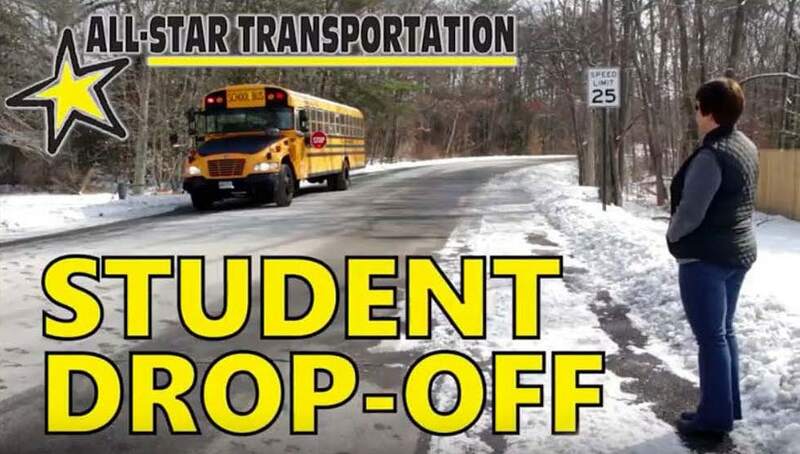 The drop-off procedure video details all the steps a driver must follow when dropping off students at their bus stops. The video explains and demonstrates the carefully considered safety reasons for each step of the drop-off process. To emphasize that point, All-Star’s next training video will target driver complacency. The video will be available soon as the company prepares for its Spring into Safety! program. You will find the video and all others on All-Star’s website and YouTube channels. 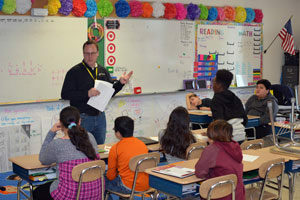 DERBY – As Steve Gardner paced at the front of a classroom, providing information and asking questions, students responded by raising their hands and revealing what they want to do when they grow up. “Play Major League baseball,” said one of the students in Jory Pirritino’s fifth-grade class at Irving School in Derby. But the student was unmoved, saying confidently that he would be one of the few to make it. 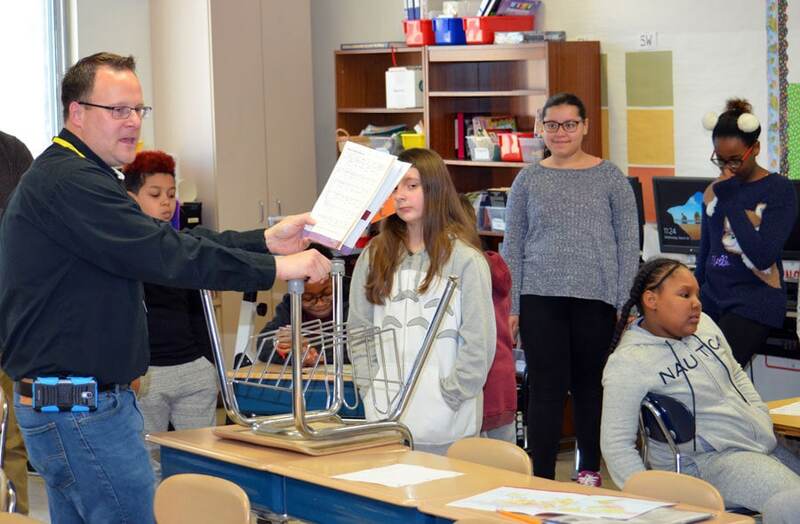 Gardner, who manages All-Star Transportation’s terminal in Seymour, was in the classroom for a Junior Achievement program known as JA Our Nation. 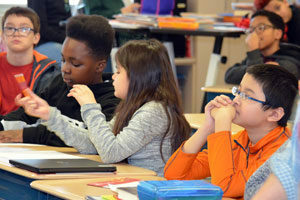 The program is designed to “introduce students to the intersection of work readiness and upper elementary grades social studies learning objectives,” according to Junior Achievement. The program requires volunteers like Gardner to engage students in hands-on activities that teach students about our country’s free-market system and how it creates jobs. Students also learn about entrepreneurship and innovative thinking. Under the program, volunteers host five 45-minute sessions spread out over five weeks. Gardner agreed to become a first-time volunteer after being contacted by Candace Lebel, a teacher at Irving School who coordinates Junior Achievement activities. Gardner had never met Lebel in person, but he was familiar with her because of her requests for buses for school trips. After deciding to participate, Gardner met during this past fall with Melanie Strout, the program manager for Junior Achievement of Western Connecticut, to review materials he would need for the program. “I thought the most challenging part was getting all of the students engaged at the same time and getting their attention. There were 21 students and not all of them have the same attention span,” he says. While educational for the students, the experience also benefitted Gardner, providing him with insight as to what it takes to be an effective instructor. And he says if he is asked to volunteer again, he would gladly return. WATERBURY – When Nick Rocco Scalia was a young boy growing up in Waterbury, he greatly enjoyed movies and TV. And so, when it came time to pick a major in college, it was no surprise that he decided to study cinema and film production, completing his bachelor’s degree in those subject matters at the University of Hartford in 2004. But because he also harbored the idea of teaching, he returned to college to study English, earning a master’s degree from Trinity College in Hartford in 2011. Now, he’s combined his passion for film and teaching as the media producer for All-Star Transportation and its sister company, The Next Street. 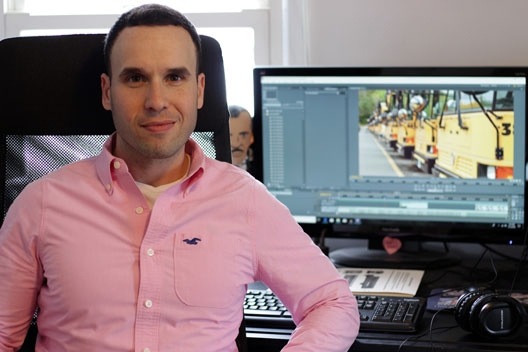 To date he has created more than 20 videos for All-Star (plus dozens more educational and marketing videos, and commercials for The Next Street) that are shared company-wide during safety meetings, training sessions and on the company’s website. In addition to his work for All-Star, Scalia works as a contributing writer and film critic for Film Threat, an online publication focused primarily on independent film. Recently, he was given the green light to begin writing a regular column for the publication. He is also an adjunct English instructor at Post University, where since 2013 he has taught both online and on-campus courses. Earlier, from 2011-2013, he was an adjunct English professor at Salter College in Chicopee, MA. Because working as an adjunct is notoriously risky with no guarantee that today’s job will be available tomorrow, Scalia was looking for something more stable when he spotted All-Star’s ad seeking a media manager. It struck Scalia as curious that a school transportation company would hire such a person. To his pleasant surprise, he has found that there is a steady need for instructional videos and that has allowed him to tap into his interests in film and teaching. He does the scripting, filming and editing for each video, striving to make each sound and look good. Until he joined All-Star, he had never done instructional videos, which he finds especially challenging because forgetting to mention any bit of information can be critical. So, he must be mindful of every detail. “It’s been interesting,” he says, adding that he’s learned a lot about what it takes to be driver and a monitor. He credits Brenda Bass and other members of All-Star’s safety team for the success and quality of the videos he has created. As for the future videos, Scalia says hoping to acquire a cutaway of a bus, which would make filming easier. “It’s really tough to do a shoot in a bus,” he says.